ATLANTA -- President Donald Trump got his own national anthem moment Monday when he took the field before Alabama and Georgia faced off in the College Football Playoff National Championship. Months after wading into the culture war over protests during the anthem, the president was greeted by tens of thousands in Atlanta with cheers and a smattering of boos. After ROTC members escorted him onto the field, the president stood with his hand over his heart and an American flag pin on his lapel. He sang a few words as Georgia's Zac Brown Band and a gospel choir performed the anthem. "We want our flag respected," Trump said earlier Monday during a speech in Nashville, Tennessee, "and we want our national anthem respected also." The president watched the game from a private box overlooking the Alabama sideline, flanked by ROTC students. The Tuscaloosa News had reported that he would appear on the Alabama radio broadcast during the game, but that didn't happen during the first two quarters. 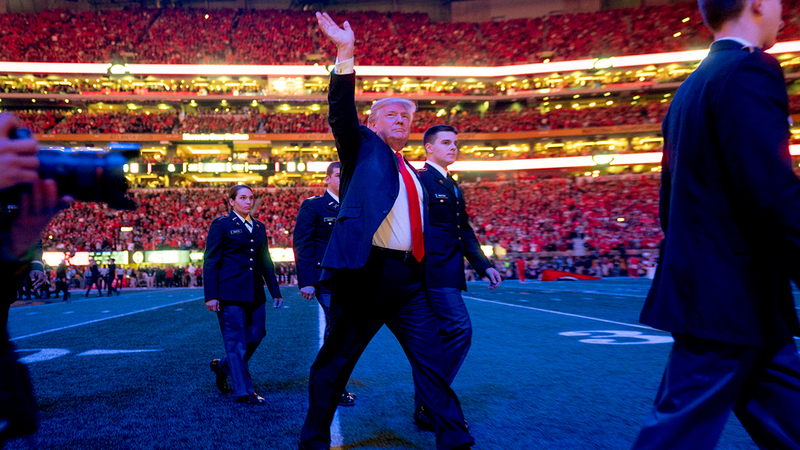 Trump departed the stadium during halftime as Georgia led Alabama 13-0. Rapper Kendrick Lamar, who has been a critic of the president, was set to perform during the break. ESPN, which televised the game, said Sunday that a game-time interview with Trump was unlikely. Stephanie Druley, ESPN senior vice president for events and studio programs, said the network had been in contact with the White House and she did not "get the sense" that an interview would be arranged. Trump criticized ESPN in October after "SportsCenter" host Jemelle Hill tweeted that he was a "white supremacist." A network will often seek to interview the president when he attends a game it is televising.